If you are worried about the condition of your south East London garden, find out today how much of a difference it can make to hire the right professional help. At London Gardeners, we want to make sure that every single person has access to the best gardening services and the best gardening professionals. There is never anyone better to make sure that you are able to get your garden back to its best after a difficult winter. We have spent years learning every single aspect of lawn maintenance, from weed control to grass cutting, leaf clearance to garden waste removal. With our help, you can discover a service which is designed from the ground up to make sure that your garden is always looking at its very best. No matter what you need, we are here to help and there is no better way to find out how much we can help you than by giving our offices a call today. Simply ringing up 020 8434 7256 could be the perfect way in which you can find the South East London gardening experts which really want to help you. While London is a big city, one of the most populous areas is the one which is found in the south east of the city. While much of the attention is lavished on other areas of the city, the places found in the se postcode such as Bexley, Bromley, Greenwich, Lewisham and Southwark are all vital and interesting areas of the city. The Naval College in Greenwich is one of the most architecturally impressive buildings in the country and has been a world heritage site for a number of years. The nearby observatory is also of great historical importance as this is the area in which Greenwich Mean Time originated. The surrounding areas such as Thamesmead and Woolwich offer a more suburban approach to city life with many people choosing to commute into the centre of the city. This is possible thanks to the DLR, the Docklands Light Railway which is an extension of the tube network and there is even a ferry in Woolwich which can make crossing incredibly easy. South East London is also home to a number of interesting museums and galleries for those who are interested in the cultural aspects of the area. Not only can London Gardeners help with the maintenance of your South East London garden, but we can help you create something truly beautiful. If you have a large open space and would like to find out how much better you could make it, our garden design services are perfect for you. After just one conversation, we can help you realise the true potential of your garden and our garden design is always on hand to help make the most of any exterior space. 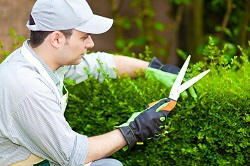 Once everything is up and running, our garden maintenance services are perfect for keeping everything at its very best. But we understand the importance of not only getting everything looking great, but doing it at the right price. If you want to get not only an excellent reliable gardening experience, but a cost effective one as well, find out today how much money you could save with the help of our fantastic team of experts. We price our services in a way which ensures you get the best possible value for money. If you would like to learn more about what exactly we offer and just how much money you could save, call 020 8434 7256 can take the first step towards a fantastic South East London garden.